There seems to be an error with brawlers ranbosses. Line 264 tries to set 'power' from Backstab's getDamageBoost; this won't exist until 1.5. This isn't even when I'm in the infinite dungeon. 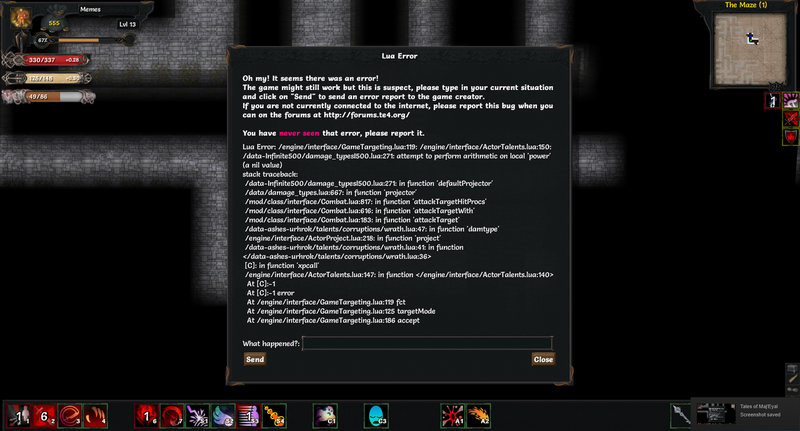 I started a new character, tried to use slime spit as an example, and got this error 7 times at once. And then I'm booted to the main menu. I can fix this by turning off the "deceiver" addon class, but find it very odd that it doesn't happen when I500 is turned on. Well, it seems that bugs are smarter than you think and pick your time off from coding to reveal themselves . My apologies for the long delay in getting to this . I have posted version 2.5ga (ToME 1.4.8 ) at http://te4.org/download-addon/4272/tome/Infinite500 and to Steam. This is basically a rollback to version 2.5g with a tooltip fix that should not include any 1.5.0 dependent code (specifically, some of the rogue rework changes). Please advise if there are still incompatibilities with ToME v 1.4.8. The bugs you're seeing appear to be due to other addon(s). The 'combatGetFlatResist' bug is probably caused by the file class.interface.Combat.lua being overloaded en toto. First post only to thank you for making the game and this mode better!! i dont know anything about programing and lua, but i would gladly help in improving this addon, especialy for this part "map effects with dungeon level, more level variability (layout, size, etc. )", and more vaults types maybe... adding this things to the addon will be awesome!!! I'm bought some items earlier on first or second floor and there were no problems. I have updated version 3.0 (for ToME 1.5.0) to http://te4.org/download-addon/4543/tome/Infinite500 and to Steam. Enhancements to the I.D. are incorporated, including new challenges, random layouts, etc. NPCs scale up more slowly in the early I.D. levels. Some talents and status effects have been adjusted for scaling/bugfixes. See the Game Options menu for a summary. More than one category point can be spent on each talent tree. Points after the first increase the mastery level by 0.1 instead of 0.2. Most of the isolated shops have more inventory and the Lost Sniper will correctly stock ammo. Abandoned gravesites no longer use a pop-up so as to be less annoying. Open with "<" or ">". If you are Cornac and start new infinity campaign you will at 2lvl and after get more class and general points. In main campaign is okay for cornac and they don't get extra talents points. I have uploaded version 3.0a (ToME 1.5.0) to https://te4.org/download-addon/4564/tome-Infinite500 and to Steam workshop. This fixes the bug with Chant of Fortress and Cornacs getting too many talent points. Getting errors when I mouse over Unarmed talents on adventurers. (running only official addons, orcs, embers, possessors, and vault). It looks like you have more than official addons; the error is referencing the Infinite500 addon, which I believe is the problem here (I've seen this several times now and only from people using that addon). @Sinistrality @Stunt thanks for the bug reports. This is indeed an error in I500. Technical details: This is caused by a loading error with I500's redifined newTalent function, that was causing it to not see certain globally defined talent functions (see ActorTalents.main_env scope). It most frequently shows up in talent.info calls. I have uploaded the fixed version to https://te4.org/download-addon/4594/tome/Infinite500 and to Steam Workshop. Does the crit shrug off -> crit multiplier reduction change work with Daneth's Neckguard too?